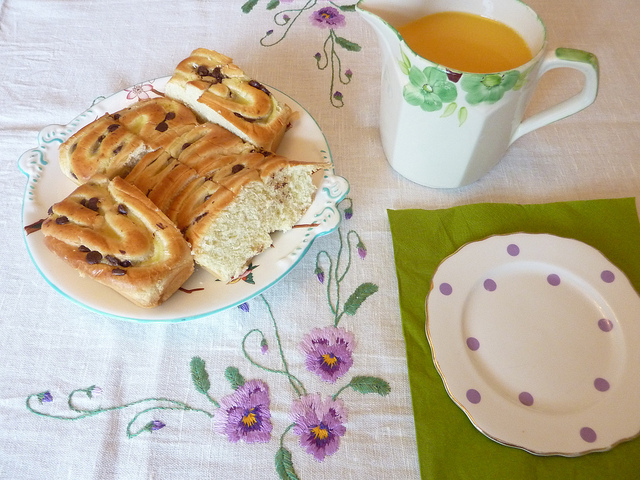 I have a fondness for setting a nice breakfast table - always at the weekends and if possible during the week too. If you care to gander over to these older posts you will see how I like to 'track' the ages and have a 'theme' to the breakfast (what!!!!!!!). So here was the 70s breakfast and here was the 1940s breakfast and Arts & Crafts breakfasts (featuring hearts at breakfast time!) 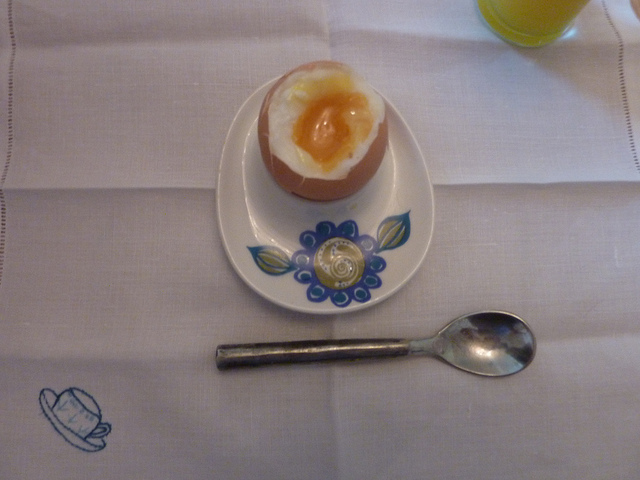 On today's post I have dug out some old photos of mine of various breakfast tableaux (what.... again!!!!!!) for your delectation. To be honest this mug is best suited for hot chocolate in the evening but sometimes I just let rip and use it whenever!!!!! Orange juice for the children. In the photo below I remember very clearly that this was Maille's choice of china and co-ordinating tablecloth - best to instil table laying skills early on in life I think. I calculate that about 5% of china and tablecloths have been photographed for 'The Custards Photography Bank'. 'Archiving' is a slow and steady process. I know that this shall cause a ripple amongst us but I only like Marmite on toast - NOTHING else will do. I am sorry but it has to be said. 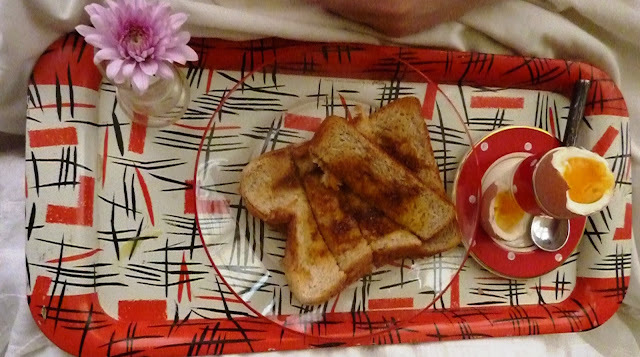 The one above was when Bronte was ill one day - so breakfast in bed. I am showing a 'range' of styles here - which type do you prefer I wonder? What a cheery start to the day at the Custard Household it must be when greeted by any one of these delightful breakfast table settings!!! We particularly like the herbaceous border look. Rather like having a picnic outside only in the warmth of a cosy kitchen. The best of both worlds. 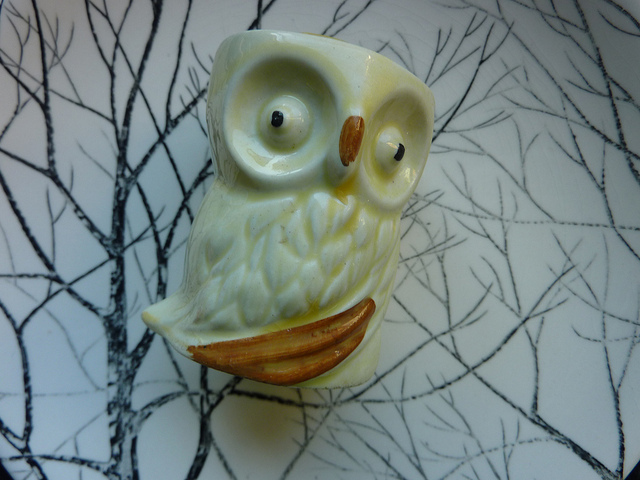 On Fridays we often treat ourselves to eggs for breakfast, believing some old wives' tale that too many eggs can cause untold and irreversible damage although to what we have no idea.Alas, however, we have no wise owls to hold our boiled eggs!!! Many thanks as always for your kindest of words. I am not familiar with that particular old wives tale! No wise owls - I am sure Budapest harbours a few. 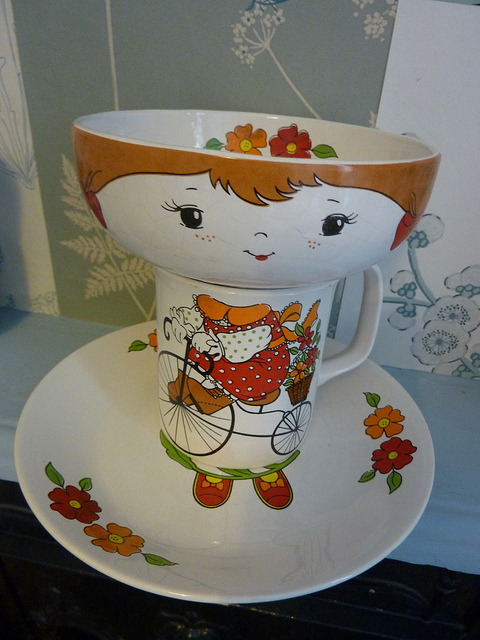 I love the mug/bowl sets - I've never seen one before! More photos please Jenny - egg cups next? or perhaps jugs?? I have a bit of thing for chairs too and a glimpse of your favourite is not enough!!! Bring on a chair post please! Ha ha - I will try and cobble a chair post one of these fine days - I fear that I have whipped you into a frenzy as my chair are quite ordinary! Ours too used to re-enact that scene - gets a bit less chaotic as they get older! 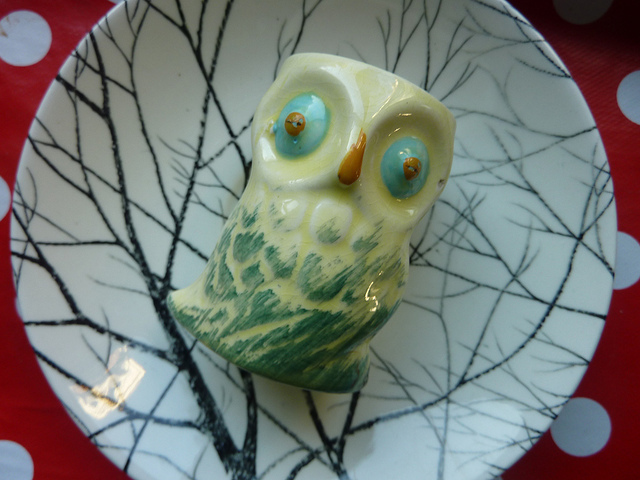 I think the second owl egg cup has a slightly guilty look - do you think it explains the rather surprised look on the first owl egg cup's face? Ha ha - yes indeed. I see what you mean - oh dear! Now that is a very good idea - a bit of work involved though! When the time is ready (!) I will indeed organise that (it is all written but I cannot think of a suitable photo! Can I come to breakfast at you house? 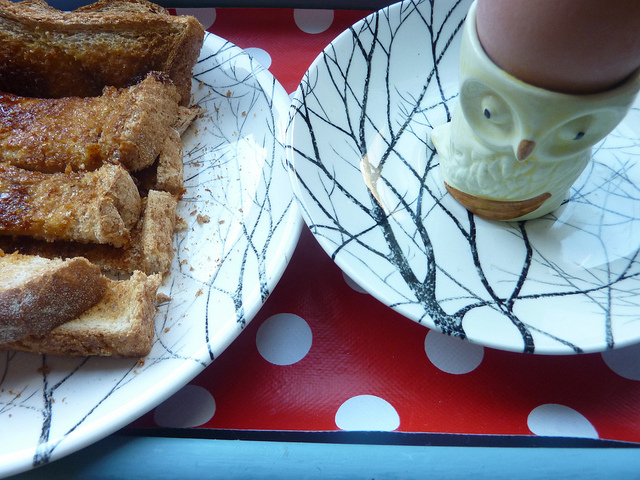 I have similar eggcup combination of the Snowman, but its a bit of a puzzle. 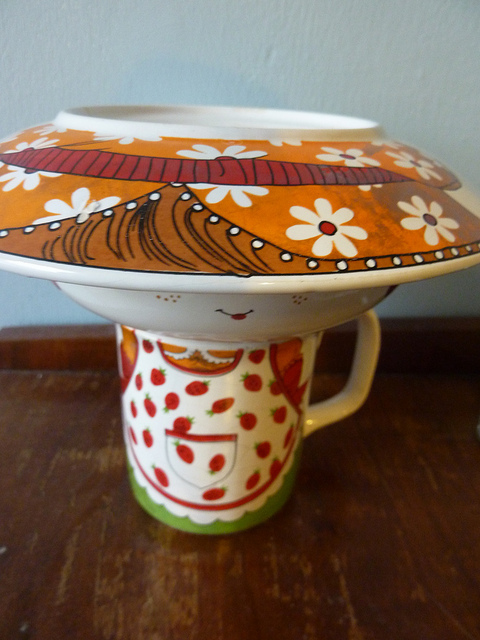 It has a plate/saucer - the hat, the egg cup is the head and the drinking cup is the body which you have to turn upside down! How do you drink and eat your breakfast eggy! Oh yes I know that combination - these are not really suitable for eating and looking at at the same time! I have been lucky over the years of scouring! There is so much to ogle at here. I really like the first breakfast set but they are all great. Just lovely china and colour. 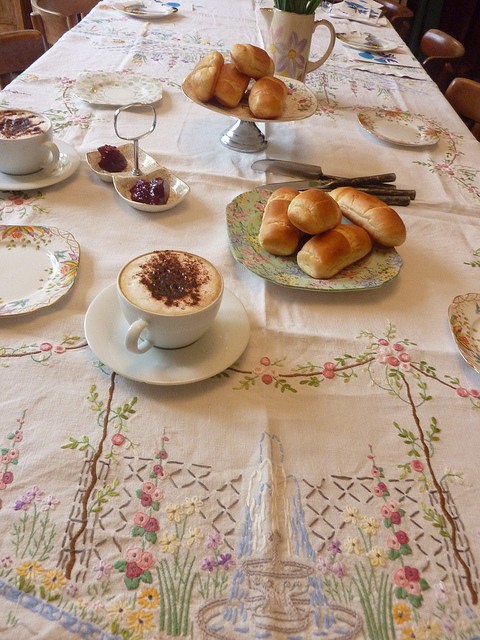 the hollyhocks table cloth is so pretty. 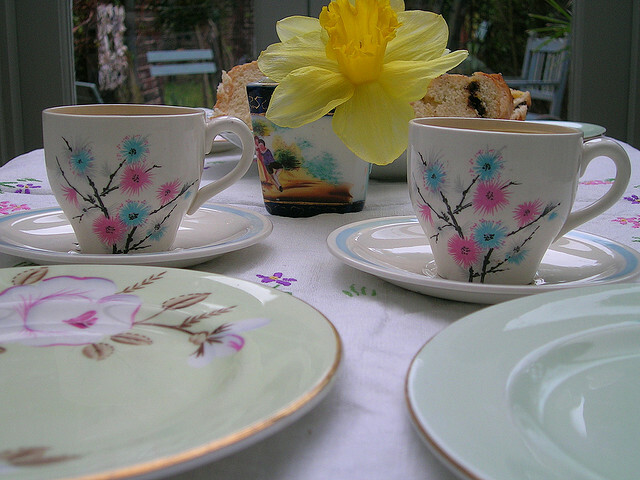 Many thanks indeed - I have a few with hollyhocks on and then there is the hollyhocks china.. Yes indeed - I usually use that at Christmas time because they remind me of snowflakes - it was £3 for a set of it at the car boot a couple of years ago so of course I had to buy it. Since seeing this blog post Bronte has now asked where those sets are - I clearly remember asking them if they still wanted them at the time!!! Lay that table with vim and verve Claire! Breakfast must never be dull in your house what a selection! Glad to see marmite is featured! How lovely! 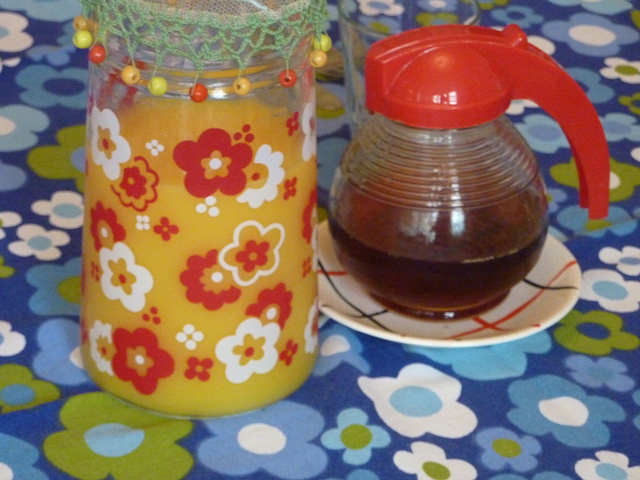 I'm afraid breakfast is very much a rushed affair in our house, weekends or weekdays. I love the mug and the jug reminds me of one my mum gave me last year that was one of her wedding presents. It is in my display cabinet as I am afraid to use it in case it gets broken! That is lovely to have such things passed down through the family - I understand your worries about breakage though! Such a sweet idea - so lovely to take such care in something that so many people skip over as fast as possible. I've left a blog award over at mine for you - have a lovely weekend! ~ Ooh can I come for breakfast, me deary!! 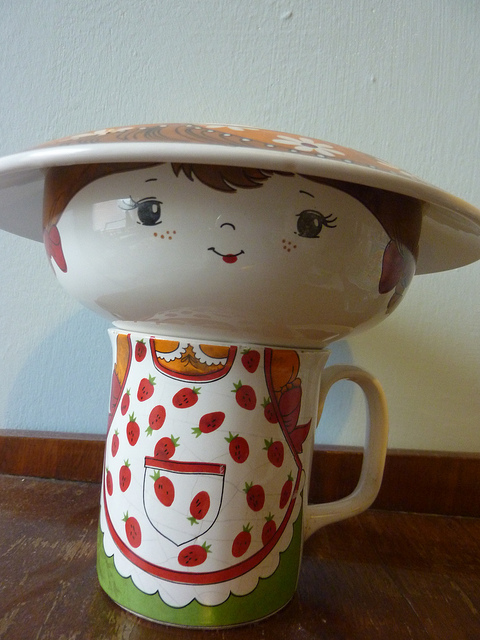 Some of his delightful pottery brings back memories of staying with my Grandma, which was lovely! 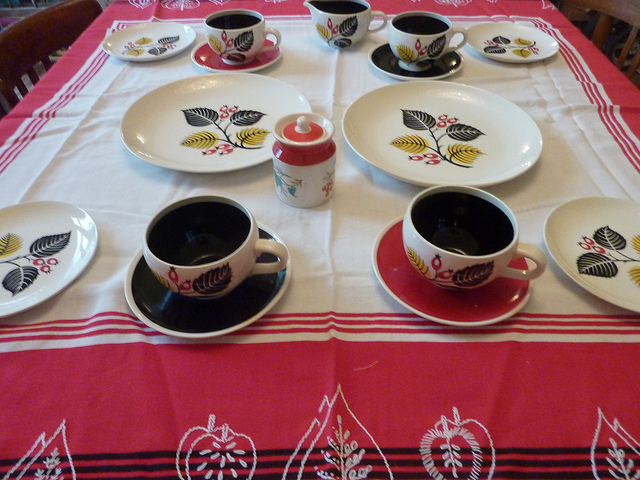 My mum always laid the table like this for our visits and I try to do this as much for evening meals...Loved looking at all your crockery Jenny....and the fact that you use and ENJOY using it and nothing is to precious is wonderful! 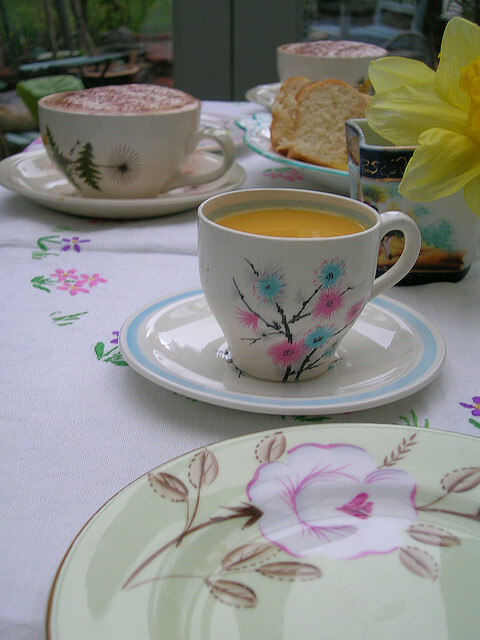 Breakfast and tea - the best times for china laying I think! 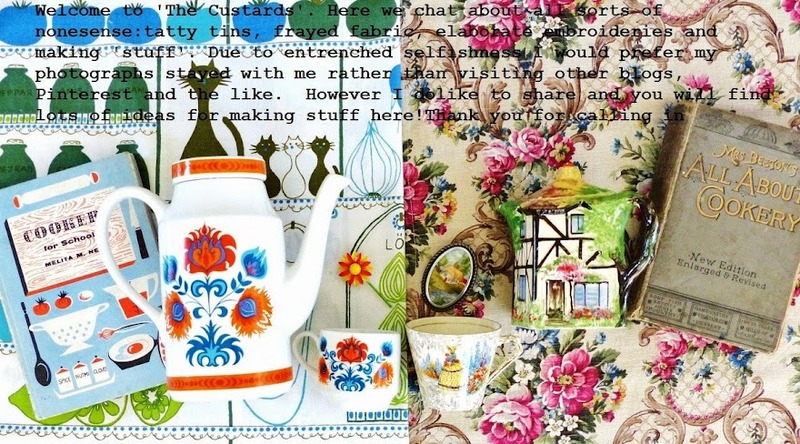 I love looking at all your china, it reminds me of growing up surrounded by family in "The Potteries" - my Grandma had cupboards full of different china tea and dinner sets - I still love "playing" with a tea set! Now Devil sludge is not a term I have come across before Nicky! A great term though - I am a consumer of Devil Sludge!! Dawwww - thank you. It is a house with a great deal packed into it...one day it will have to be cleared. Oops I was obviously thinking od horses when i said stable, I meant staple! Jenny .What a great post. I love your childrens sets they are so sweet. I would like to have my table laid out like this everyday, but there isn't time. I try to do this the weekend. Or mainly in the evenings I set our coffee table for tea and cakes in front of the fire. We all love it. You put my perching on the sofa with a quickly microwaved bowl of porridge to shame!